WORLD WI-FI Global free wireless network. The World Wi-Fi project is a global, decentralized free Wi-Fi network on private routers (most of which are home routers). Each owner of the router can distribute free Wi-Fi, connect other users and earn a crypto currency. In the end, everyone wins: ordinary users can not pay for the Internet, the owners of routers receive revenue, and advertisers their target audience. World Wi-Fi is a world project that is built by the community. 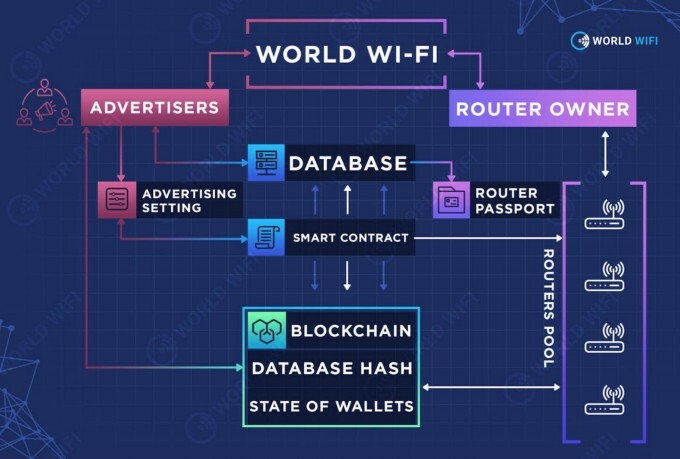 The WORLD WI-Fi platform is developed with the use of Big Data technology to collect and analyze non-personalized data on user activity, which allows advertisers to demonstrate their advertising to those to whom it really might be interesting. The technology of blocking allows making transactions between participants of the process quick and cheap, providing mutual guarantees to the parties, thanks to smart contracts, and providing advertisers with absolutely reliable and transparent information about the advertising campaign. Airbnb did not build hotels, but offered everyone a little to be the owner of their own hotel. Uber did not start a taxi fleet, but he offered anyone to make money on his own car in his spare time. The company is launching a large-scale project on the basis of a successful business in the field of WI-FI hotspots and advertising in WI-Fi networks. Radius WI-Fi and the Adrenta platform operate in 80 cities and have a staff of 100 people. The growth of connected points for the year amounted to 784%. 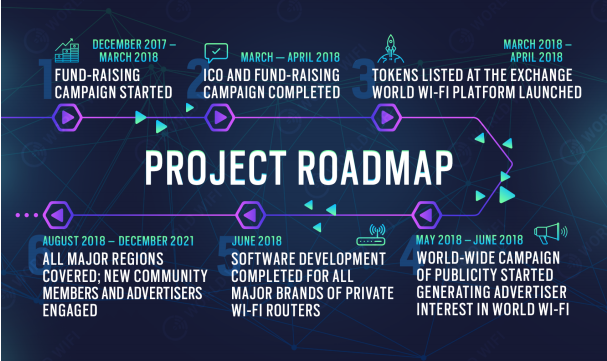 The company analyzed these existing business models and realized that, thanks to the technology of blocking, it is possible to create a global decentralized Wi-Fi network and make it free for users through advertising. Television is also working now; The only difference is that the company is sufficient to show a short and unobtrusive advertising when connecting to the network, so that the project is commercially effective. Demo version of World Wi-Fi is already running in test mode. The main market that forms and operates the World Wi-Fi project is the online advertising market for home Internet users. To date, this is a huge free niche. 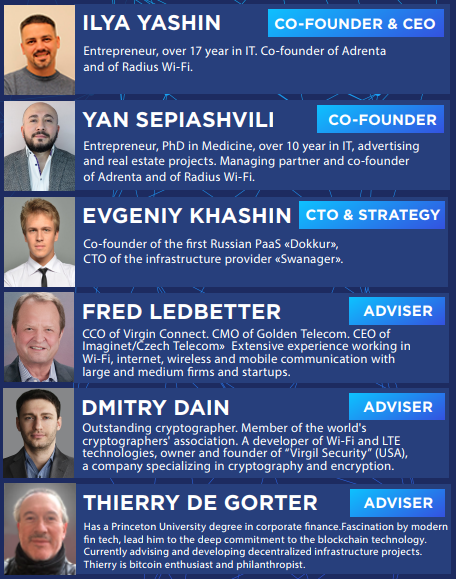 The current projects of Adrenta and Radius Wi-Fi are focused on Wi-Fi advertising in public places (airports, cafes, restaurants, shopping centers, etc. ), they will be included in the World Wi-Fi platform and on their basis a free market Internet in public places around the world. 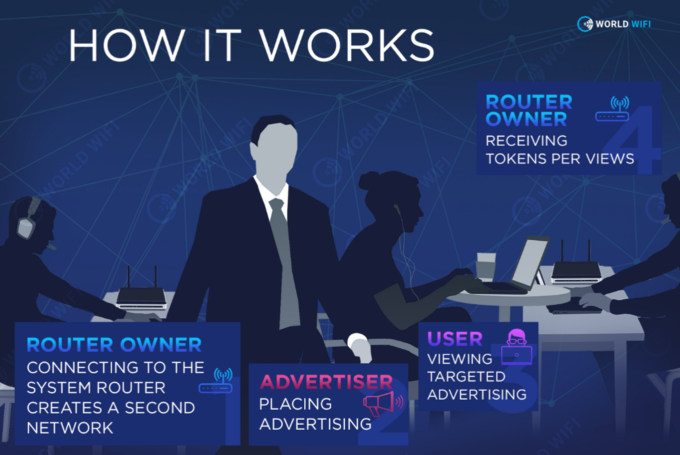 The system is a decentralized network of advertisers, router owners and network consumers. To solve the problem of possible data falsification, control of the fact of display of advertising materials, as well as to guarantee fulfillment of the obligations for remuneration in favor of the owner of the router, the Graphene blockade (or any other DPOS analog) is used. In general, it is necessary to use privileged participants to ensure control over the correct execution of obligations between all network members. A program for the remuneration of delegates is envisaged. The function of the delegate includes storing the replicated state database of network participants with information on targeting, which is indexed data by fields: geocoordinates of the router, number of users, age, interests, information on past advertising campaigns (ROI, conversions).In fact, the database is an indexed convolution of data from the block. This is due to the need to quickly select a supplier for requests from the advertiser, as well as to calculate consumption statistics, which forms the main value for the advertiser.Access to this information must be prompt. It is also possible to use blockers that enable indexing out of the box. In principle, this applies only to delegates, namely, the software part on their side. During pre-sale and Token Sale, 258 million WT will be available for purchase. Unsold tokens will be destroyed. Tokens WT WeToken (WT) is the domestic currency of the World Wi-Fi Platform, all transactions within the platform will be carried out only in WeToken. The Token Issuer will be World Wi-Fi PTE Ltd. WeToken (WT) will not be a valuable paper because the value of the WT token depends entirely on the actions of the Platform participants. The platform operator has a completely mediated role in the Platform. With the full legal status of the sale of tokens and their tax and legal status, it will be possible to familiarize themselves with the Memorandum of Placement. During the ICO, ETH ERC20 tokens will be sold. 1 WeToken = 10 commercials in World Wi-Fi = $ 0.1 — at the ICO stage. To date, the average market cost of 10 impressions of targeted advertising in Wi-Fi networks is $ 0.3. Thus, the price of the token on the ICO is the original discount.